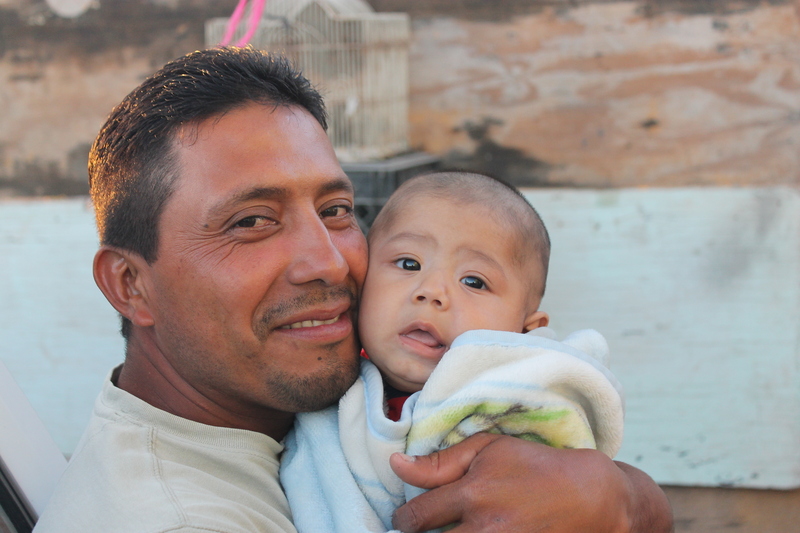 Day 53, Sunday June 16 – This is the second father’s day in a row that Jacin has spent in Tijuana. We thought it would be fun to attempt yet again to get some photos printed for Juan and Alma and deliver them on Father’s Day. We did remember to take the hard drive this time, but it was too big for the photo machine to read. We decided to eat lunch at Applebee’s, where the names of all the dishes were in English, but the descriptions were in Spanish. It was our most expensive meal in a long time. We bumped into the gentleman who custom-made the doors for the church project and visited with him for a while. Our next stop was to be the (free) zoo, but Justice’s stomach didn’t agree so we went back to the base. I worked for a few hours while Jacin transferred Juan and Alma’s photos to a smaller jump drive and attempted yet again to print the photos, only to get there and have the store be closed. Why would it be so difficult? Dinner time rolled around and we were going to prepare a meal and veg, but Dave and Toni came back from shopping and other errands and invited us to deliver a bread donation (complements of Panera) to the Fountain of Hope men’s rehab, which we had yet to visit. So we headed over and met with Fernando, the director, with Jesus interpreting, a young man who had helped us with several projects already, the latest being the church project. 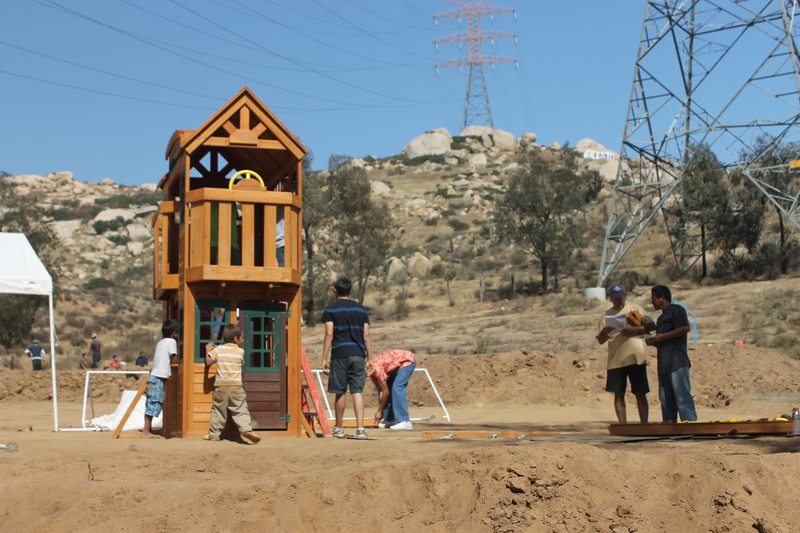 We bumped into several men who had helped with the build as well. The rehab is spacious (though mainly outdoors), with a chapel, a well, a workout area (with a few barbells and some resistance bands attached to a tree), a kitchen, and several bunk houses. It was very well kept and the man were relaxing before a hard week ahead. 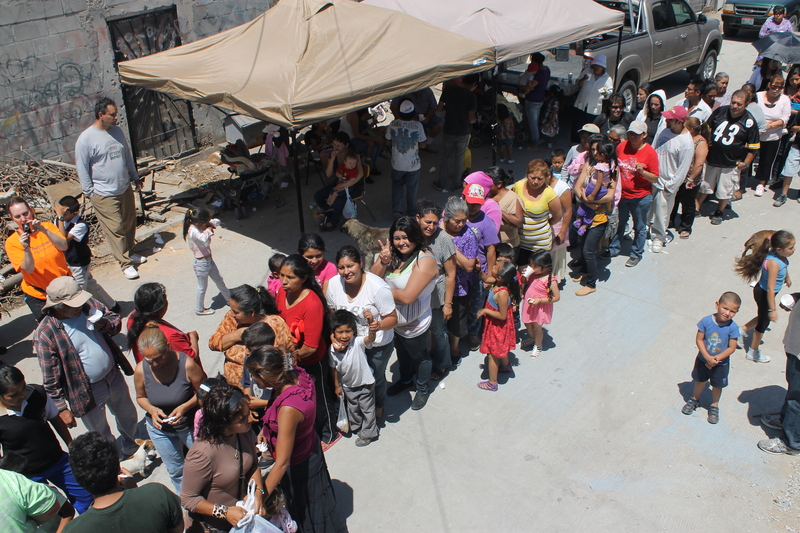 We went to Tacos Casa Blanca (not Justice – still not feeling well), where we were overwhelmed by a very large group of young Americans who had taken over the taco stand. 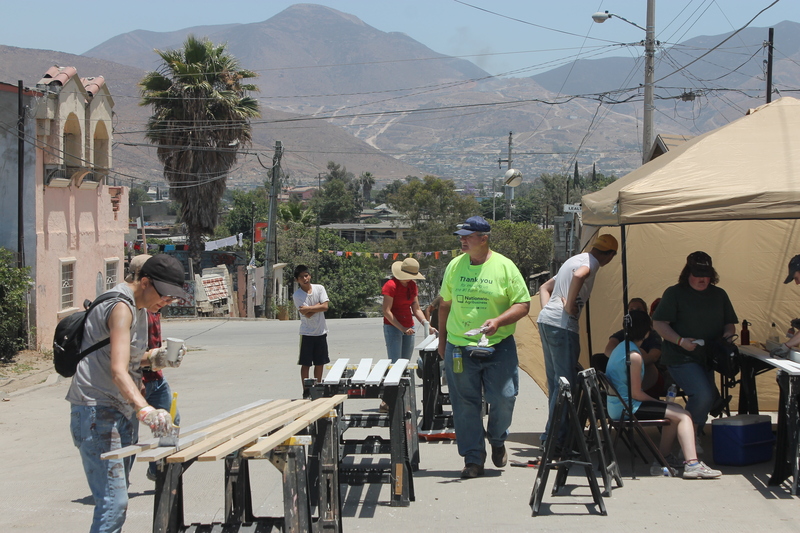 They had come to TJ to build houses as well, which were in the same neighborhood as the house and church we had just helped build. After the mandatory stop at the ice cream shop on the way back to the base, we settled in for an episode of Dr Who with the kids and off to bed. 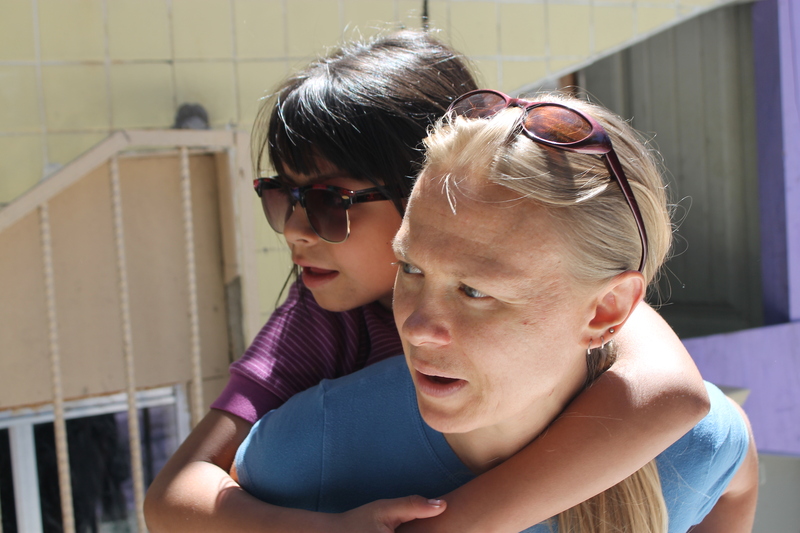 Day 54 – I stayed behind with the kids as Jacin left to pick up Carlos from Cruisin’ to assist with buying supplies (concrete block, concrete, etc) for the bases of the laundry sinks and cooking area. We are excited to see how it turns out! We had a “staff” meeting at the base over lunch to discuss the upcoming groups, the first a youth group from Calvary Open Bible in Springfield, Oregon, with 30 people, and the second our very own Open Bible Christian Center group from Rapid City! During the meeting, I certainly realized for the first time just how much planning and coordination it takes to make things run smoothly at the base. Afterwards, we picked up Carlos again to help us purchase metal for the cross for the roof of the church we had helped build, then dropped it off at the Cruisin’ body shop. They work with limited tools and materials but with tremendous results. We discussed how much of a blessing it would be to have a new welder and shields donated to the cause. I just happen to know someone who may be able to pull a few strings in that area… We made stir fry for dinner and watched Spiderwick Chronicles (thank you Lord for Netflix and Internet) and headed to bed. The first large group was due to arrive later in the evening, which meant an early morning for Jacin in the kitchen. 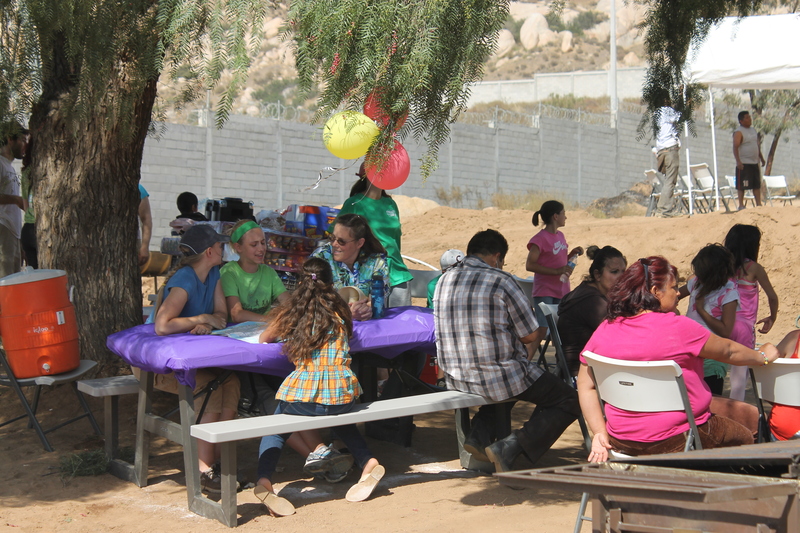 Day 55 – After breakfast, all the Puente “staff” lead small groups of the large group from Oregon in some projects around the base – painting over graffiti on a neighbor’s wall, washing all of the chairs in the auditorium, cleaning out a dog run area for Chimbu, etc. 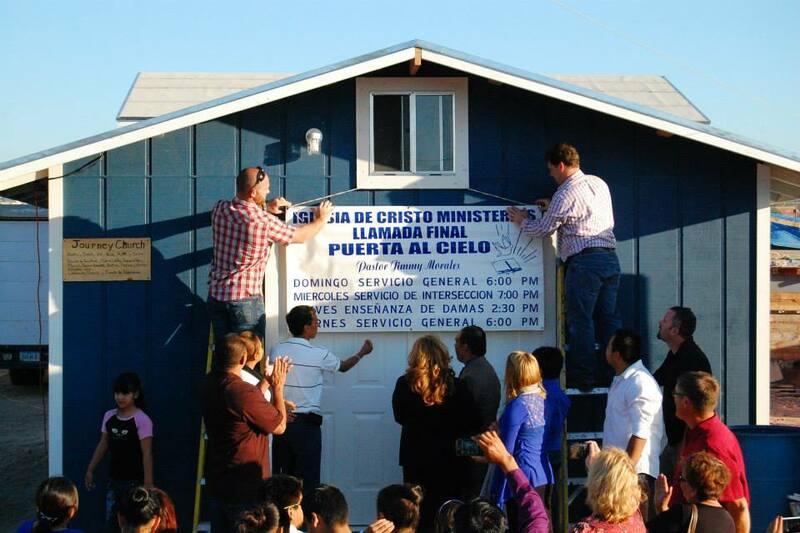 It was such a blessing to see them work with such eagerness to bless the Puente Base itself. 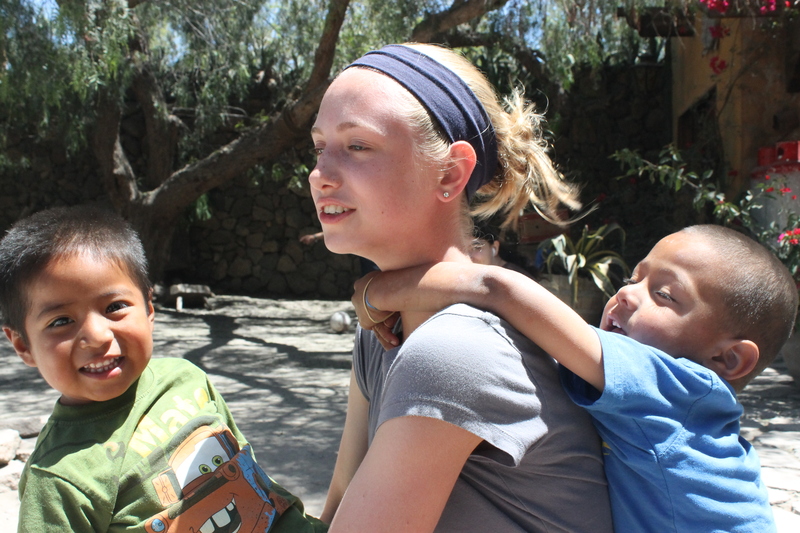 After lunch, the group headed to Casa Hogar Sion while we helped Amalia clean up the kitchen and dining room and worked on small projects. Then off to Juan and Alma’s for dinner, with Marcial as our translator. 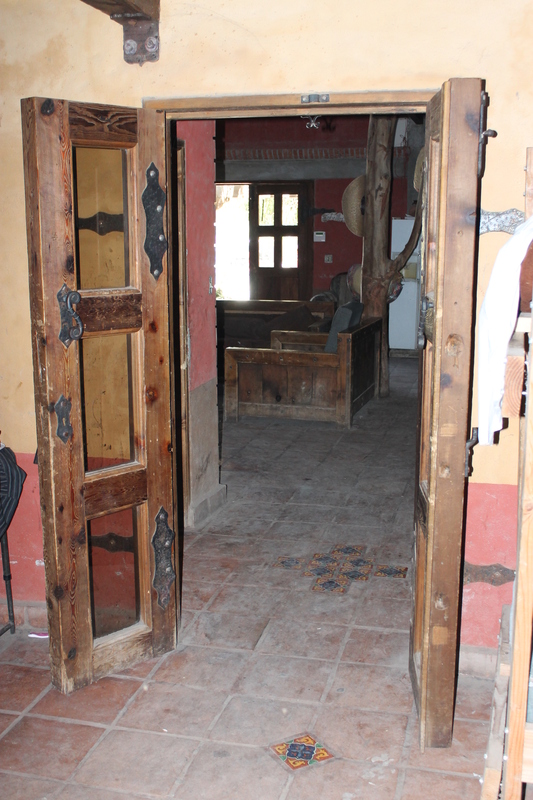 (To back up a bit, in case we haven’t mentioned this in an earlier post – Juan and Alma contacted Marcial to find out if we were still in TJ and to invite us to dinner. 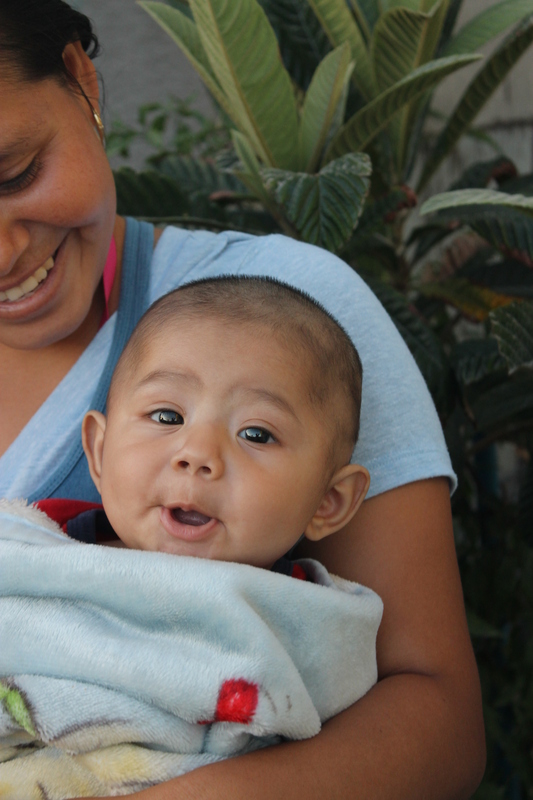 We asked if we could bring a translator, and since they know Marcial, it was a good match). Alma made mole with chicken and rice, with creamy jello for dessert. The meal was great (although the kids didn’t like it much, but I am proud to say they cleaned their plates!) and it was such a blessing to have actual conversations with them, rather than try to muddle our way through with charades. They are such a sweet, God-fearing family who are so appreciative of the little things. Their children are happy, their home is well-kept, and they are hard workers. 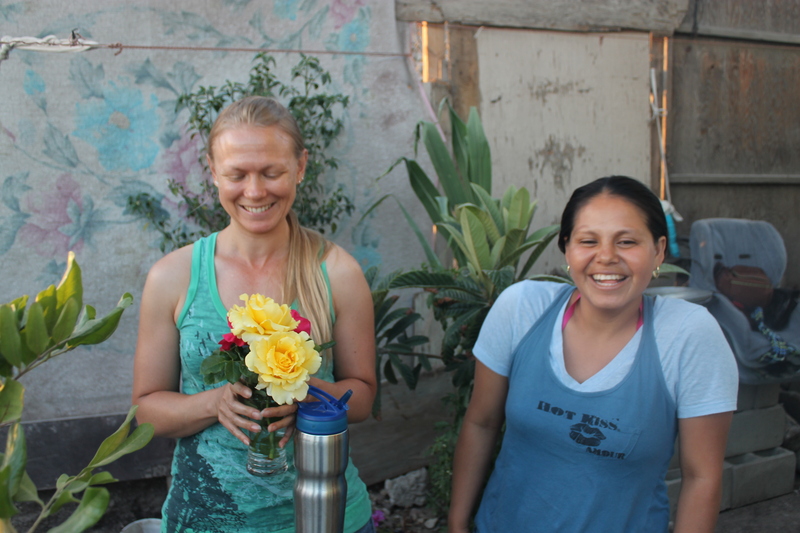 Alma gave me some roses from her garden, which graced the dining room at Puente for the next several days. It was difficult to say good-bye, but we knew we would see them at church on Sunday and arranged to sit with them. 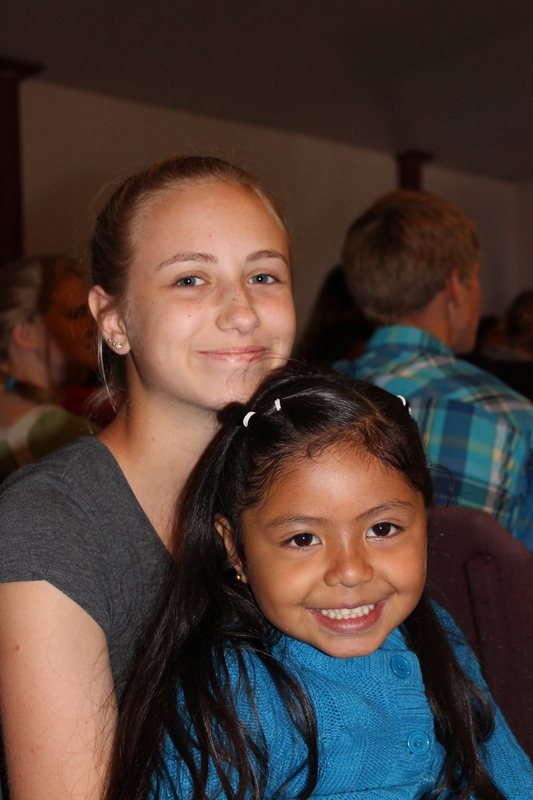 We have made so many dear friends here that it will be difficult to leave without shedding a few tears. Jacin took a new way home, which nearly required him to engage the 4-wheel drive, but it was neat to see some unfamiliar neighborhoods. Stopped (as always) for ice cream, then off to bed. 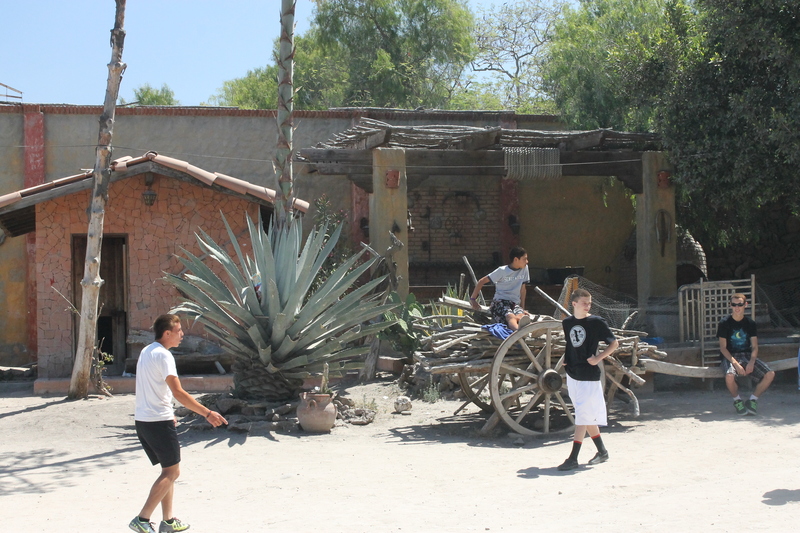 Day 56, Wed, June 19 – After picking up Oliver from his church (our translator for the day), we went with the Oregon group to a boy’s ranch, located on a historic Mexican cattle ranch. It currently houses 25 boys ranging 4 – 18 years of age. 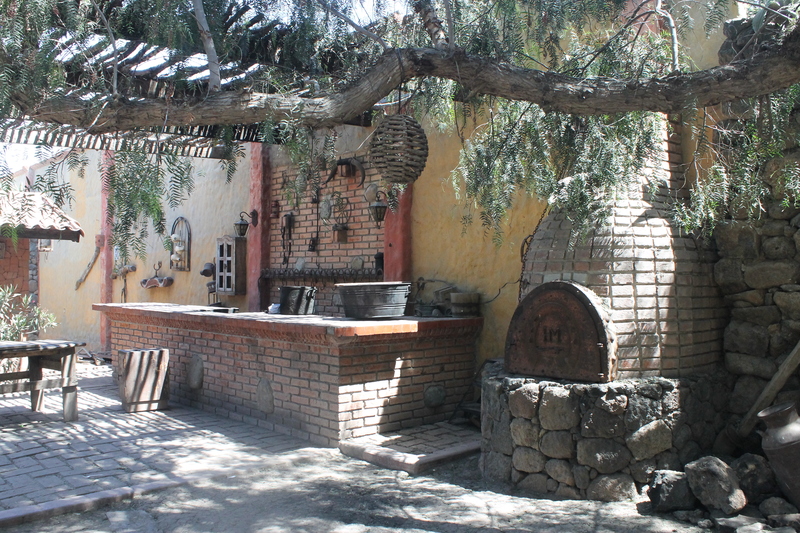 The place looked like a set right out of a movie, with the big wooden doors with cast iron hinges, a large outdoor cooking area with a brick stove, and cactus decorating the landscape – absolutely astounding. The director mentioned that their washing machine was broken, proof of which was a rather long line of laundry wrapping around the house. 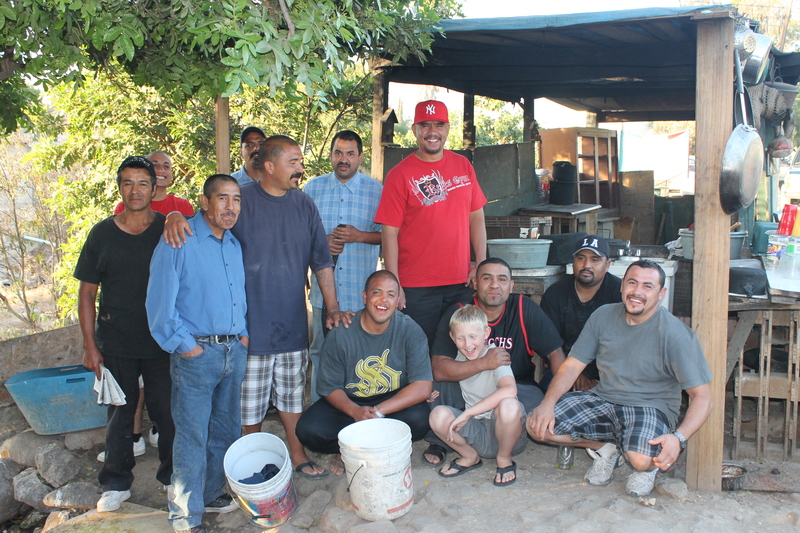 The Puente leaders had just gotten a donation directed to the boy’s ranch that would cover the cost of repair, praise God! 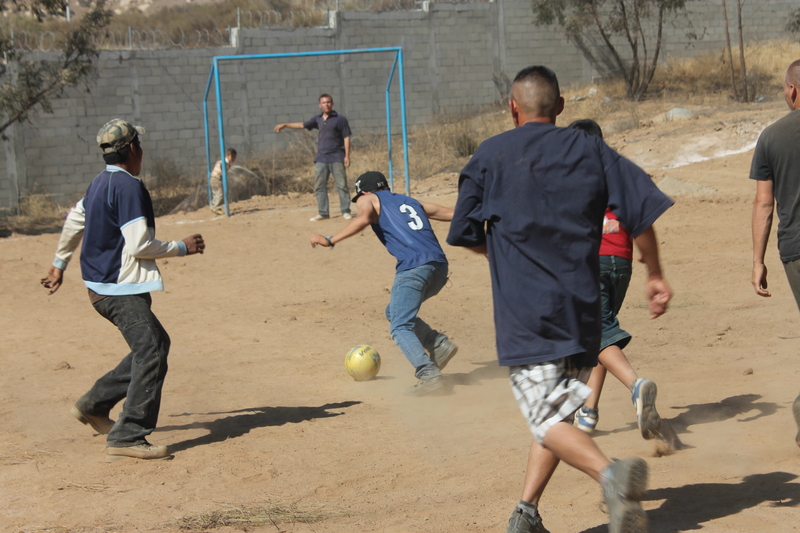 The youth group played soccer with the boys that were home during the morning session of school, and there were a few little boys to tickle and giggle with for the girls. We headed back to Oliver’s church for a picnic lunch, then off to another facility run by the same director which houses the girls and young children. 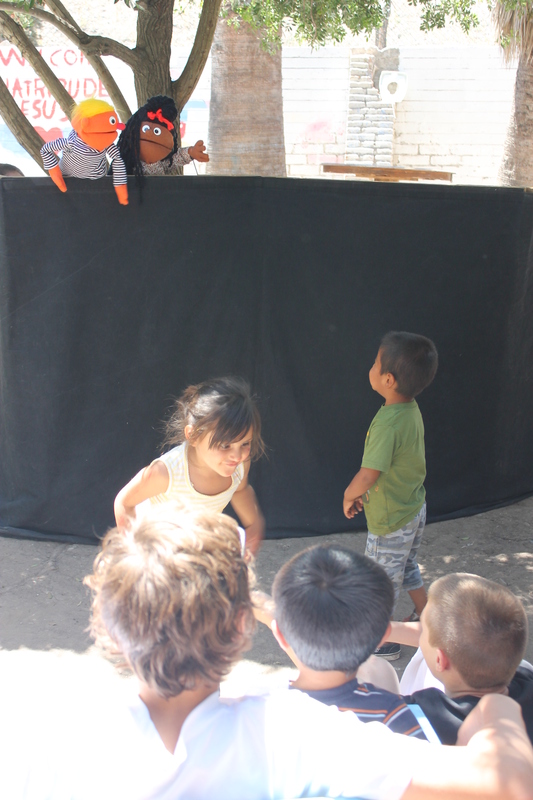 Here the youth group presented a puppet show and played some games with the kids, and in general just loved on them. 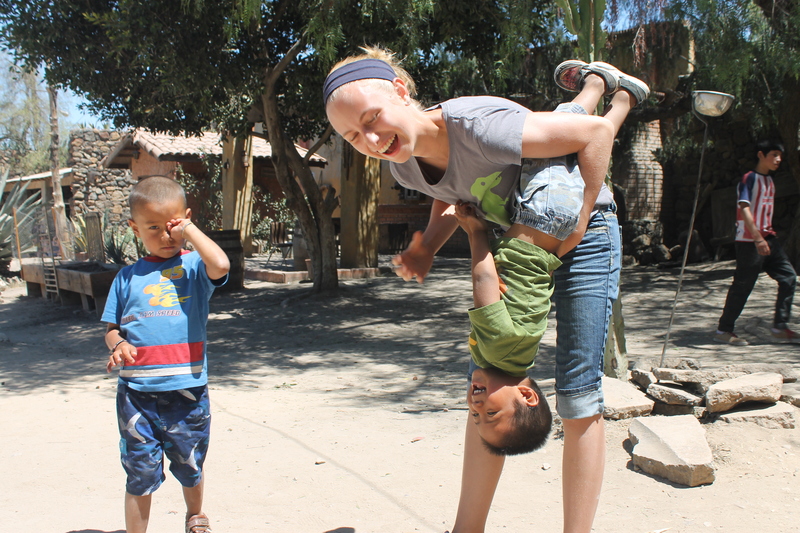 It didn’t take long for all the kids to start asking for capuchis (piggy-back rides), even the older girls who had to weigh more than 70 pounds! After a fun-filled day playing with kiddos, the group headed off to the market and we headed back to the base. The group had elected to hold their own Wednesday evening youth service rather than attend Cruisin’, so we took the opportunity to just unwind as a family. Day 57 – Up early to prepare the last breakfast for the Oregon group. We had the pleasure of getting to know Kirk, the church’s pastor, who had roots in the Rapid City Open Bible church, and he extended an invitation for us to park at their home anytime, which has full hook-ups! He has a great family and it would be a pleasure to get to know them more; perhaps God will arrange this sometime in the future. After they left, we had a busy day turning and cleaning all the rooms and bathrooms to get ready for our home church which was arriving later that evening. Jacin set up one of the portable amps and cranked up Chris Tomlin, and we could hear Amalia and Marcial singing along in Spanish. Pastor Robert from Cruisin’ stopped by to drop off the cross, and we were absolutely amazed. He said his welder asked how good of a job to do, and Robert told him to do it as unto the Lord. Well, he certainly took that request seriously! It was completely painted and ready for installation, completely streamlined with no weld seams visible. It was so much more than we had hoped for! 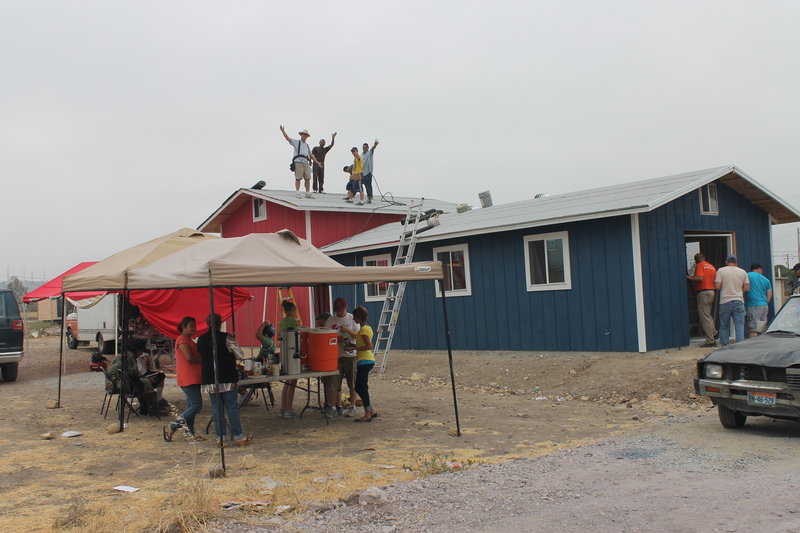 After cleaning the house, we headed to the church to put it on the roof, where we met up with the group of young adults who were building 5 stucco houses in the same neighborhood. It was great to visit with a few of them and just see how God is working to impact so many lives. As we drove away from the church, we kept our eyes on the new cross that we pray will serve as a beacon for those searching for life. 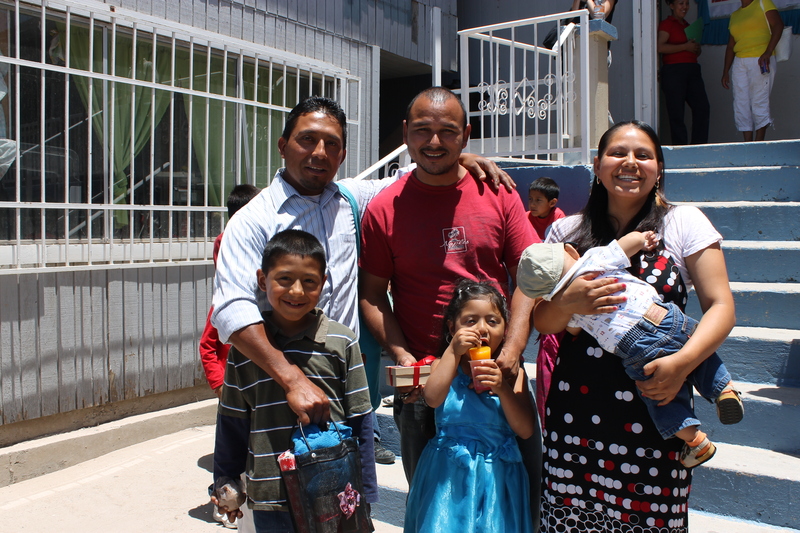 We grabbed lunch for the family and Marcial and Amalia and enjoyed a meal of fish tacos (YUM!) with them. Before we knew it, it was time for bed, but as I was finishing up my nightly ritual, I heard the OBCC group arrive, so I quickly snuck across the hall to give some hugs (and receive several that were sent by my mom!). As it turns out, Justice had beat me to it, and it wasn’t long before Jacin even joined us as well. It was hard to go to bed that night, as we were so excited and blessed to visit with people from our church family. We look forward to having more time with them this coming week. Day 58 – Friday, June 21 – I must say it was difficult to stay and clean up in the kitchen after breakfast rather than attend the morning praise and devotions with OBCC. 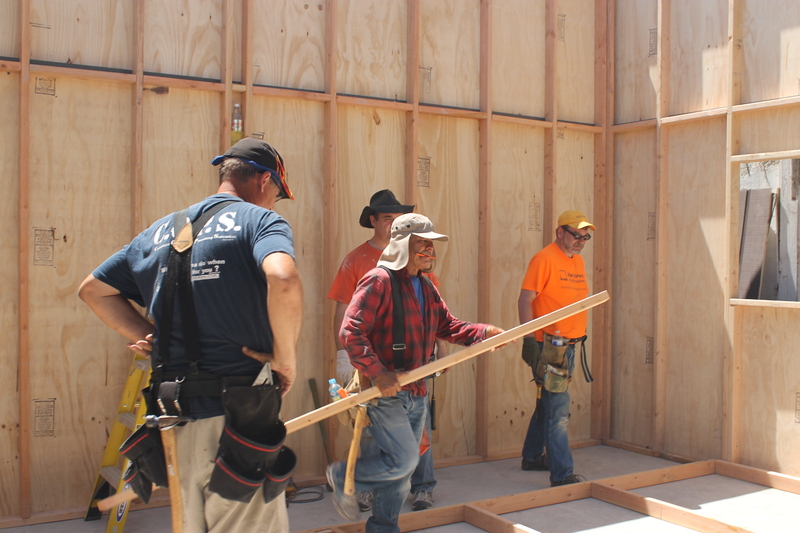 It was the first day of the house build, and they whipped through a ton of work! All siding and trim was painted, and all four walls and the floor were up. Part of the group left to walk the neighborhood and invite people to the VBS, and the kids and I left after lunch and went back to base with a small group who was in charge of planning the festivities. 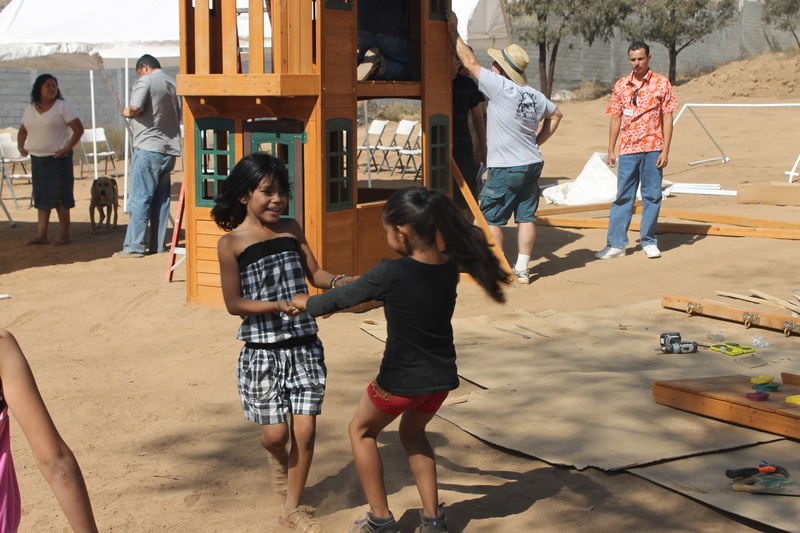 We helped them navigate through the supplies in the puppet trailer and prepare bags to hand out to the children. A new couple arrived at the base today who will be taking over our “helper” roles when we leave, a retired couple from Indiana, I believe – Ymetta and Andy. 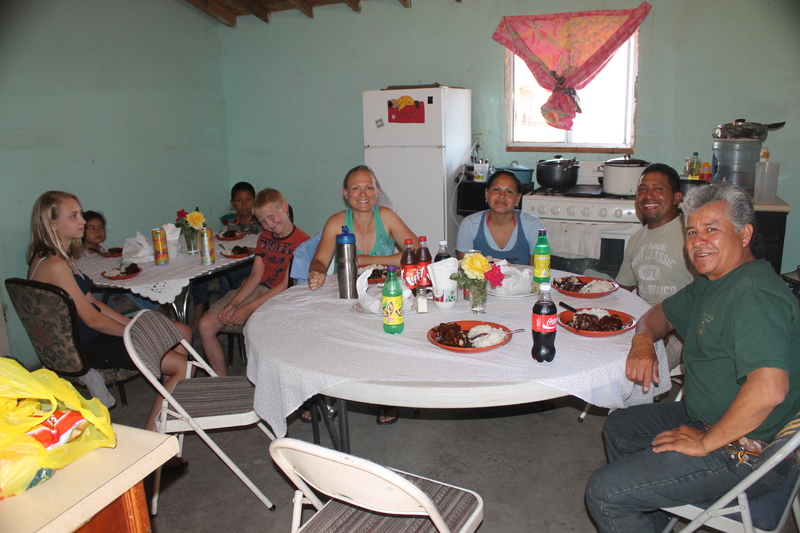 We had chicken tostadas at the base for dinner, and after clean up we were able to sit and visit with friends. We also took the nice walk to get ice cream later in the evening, catching up and visiting the entire time. We are getting our tanks filled for sure! Day 59 – VBS! The team did a great job with the festivities! Dan Bender and Fay Clegg were clowns and kept the kids entertained in between puppet shows, nail polishing, a bouncy castle, French braiding (Justice filled in here), and even a special unicycle presentation followed by some yo-yo tricks by Lucas Clegg. In the afternoon, several of the ladies went shopping for the house, a big group went to an orphanage to play with kids, and Jacin and I stayed with the building group. We had been instructed not to take a job away from anyone in the group, so, since they were progressing so well, we ended up mostly visiting with each other, which was actually nice because we have had virtually NO alone time since we arrived in Mexico. It was difficult, however, not pitching it, but there simply wasn’t anywhere to pitch in. We did help clean up the build site and shuttle everyone back to the base, where we feasted on Tamales for dinner (thanks Amalia!). There was a group who walked to the ice cream shop after the sun went down, but our family stayed behind to visit with friends. Day 60 – It was an easy morning with a late breakfast and plenty of time to get ready for church. After amazing worship lead by Sammie, the worship leader at Templo Sion, Pastor Christie gave the sermon with Sammie translating for her. Jacin had the pleasure of holding Enoch during the entire service, and he walked around with him and talked to him, praying for him and his family while listening to the sermon. It ended with leaders from Sion coming up front to pray with people, which lead to 30 minutes of spirit-filled prayer and healing. It was fantastic! We had Mike help us say good-bye to Juan and Alma and their family for the last time, which included tears, even from Jacin. 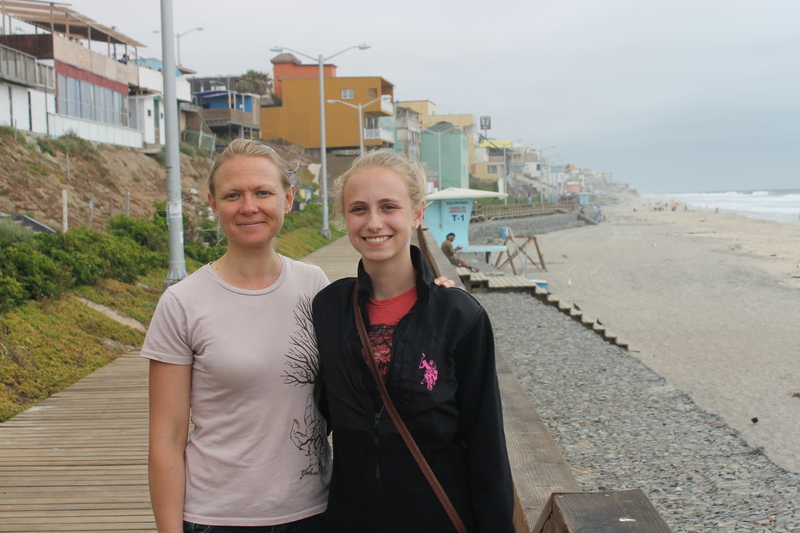 Then we headed to Rosarito with the group for an afternoon of shopping and the beach. We split from them to find a taco stand that had corn tortillas (as we found that quite a few had flour only), and we found a great little place called Pollo Feliz, where we feasted on a whole chicken with some grilled onions and jalapeños, spicy salsa and extra spicy guacamole, corn tortillas and corn chips. It was so good! Then we headed to an ice cream shop to cool down our tongues. Justice wanted to find the Veal family so that we could shop with Anna, and God granted her wish. We walked the beach with them and enjoyed their kids playing in the water. Before we knew it, it was time to head back. Dan and Carol Bender had been shopping for pottery and had found several pieces they wanted to take back, so we took them with our pickup and spent a couple of hours collecting their treasures and driving back to base. We did made it back to the base in time for some taco soup, and then we sat and visited with our friends. I was even treated to two foot baths – one by my sweet boy, and another by Toni Broom, who blessed me with her time and her kind words. It was difficult for me to say good night and go to bed, as it has just been so long since I was surrounded by so many lovely women and good conversation. Day 61 – I have been battling a cold and a frail voice for a few days, and unfortunately both kids woke up with congestion and fatigue today, so we stayed behind while Jacin went with the group on their excursions. I would imagine they will finish the house today, and they were going to take some smaller groups to the AIDS hospice as well as to the women’s rehab. I was bummed to miss these visits, but my kiddos needed rest, and it allowed me time to work on them a bit and hopefully zap whatever was trying to attack their systems. We even climbed into a twin bed together for a nap – it was sweet. Enchiladas are on the menu tonight, and I look forward to hearing about the day when the group gets back. 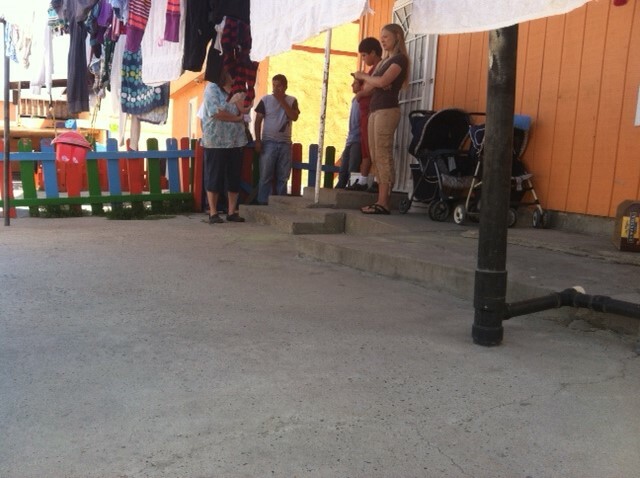 Before they left, Jacin lead us in prayer with the leaders of Puente because Kathy is headed to a conference today, so we had to say our good-byes to her. 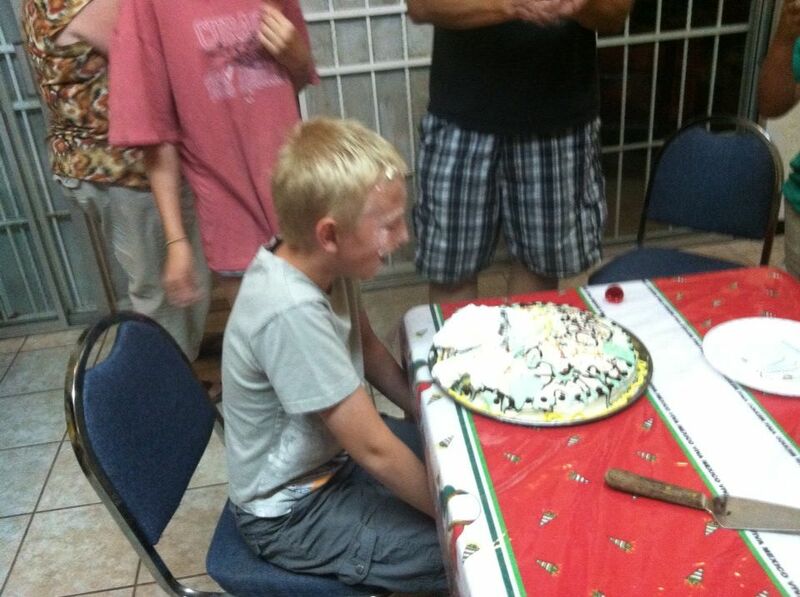 More tears were shed – it is going to be hard to leave here. Everyone is so wonderful and each has their own strengths, and it is such blessing to see them work together. Kathy keeps hinting that it would be okay for us to stay a little longer so we can have a proper good-bye when she returns, but we will be leaving when OBCC leaves so that we can spend time with our Dads. Kathy is such a sweet woman, with an amazing ability to see the best in everyone. Jacin and I are both hoping that at least a little of that has rubbed off on us. Well, that’s it for yet another week. I just can’t believe how quickly the time passes here. Before we know it, we will be back in the US, but we pray God will not let us forget our time here, that he will keep TJ close to our hearts and in our minds. We can easily see another trip back here in the Spring, and we are hopeful to be better prepared with our language before that time comes. 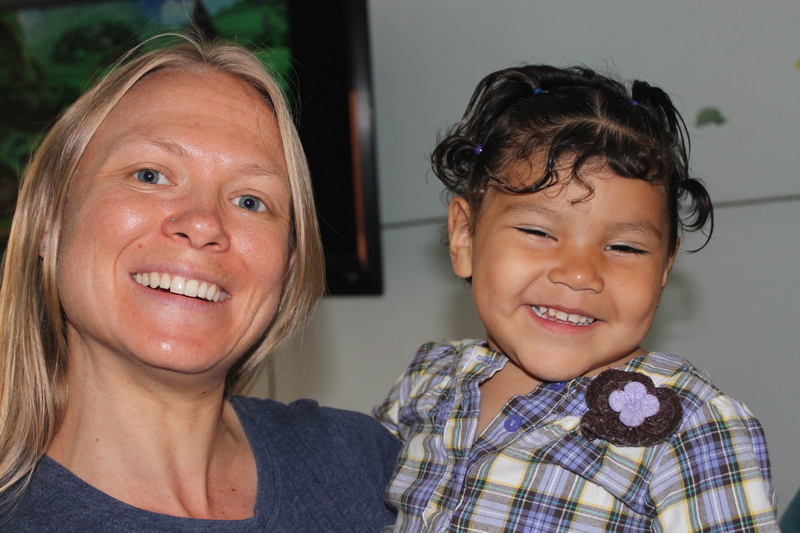 Danielle enjoying the toddlers and babies at Casa Hogar Sion. Day 48, Tues, June 11 – It was our second big day at the house/church project. We had a large group of men come to help from the men’s rehab, so roofing on the church was done by the end of the day. Justice and I helped Sarai and Reid from Journey church work on trimming the windows and corner of the buildings, while Jacin helped with roof sheeting and sheet rock in the church. 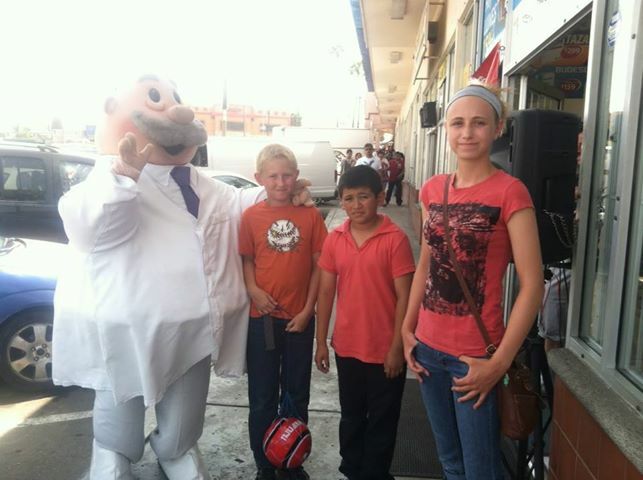 Nation tends to help when he is asked, but he also has found friends to play with at nearly every place we visit. I also forgot to mention to Jacin what I blessing I encountered the day before with him: There was a young homeless man who was trying to sell shorts to the group. None of us had any money along because we were there to work, but we offered him water. As I was painting, Nation went over to talk with him (he is the most fearless as far as trying to communicate is concerned, and the locals really seem to enjoy him). I kept an eye on the situation, as any mother hen would, and before I knew it, there was my little man with his hand on the man’s shoulder, and I could see that he was praying for him. It was a sweet sight! By the end of the day, Jacin’s elbow was screaming and my grip strength was failing. Our bodies definitely aren’t used to this type of work (anymore, in Jacin’s case). It was a long hot day, and we all crashed fairly hard after dinner and a shower. Day 49 – Justice and I helped Sarai caulk the windows, and Jacin helped Dave Phillips organized the work truck (not a small task) while the Journey team finished roofing the house (with the help of the rehab guys again) and taped and mudded the inside of the church and house. The women of the church we were building for provided lunch, which was zucchini stuffed with a meat sauce. It was fantastic! Our family ended up leaving early that day as there were just too many bodies and not enough tasks left to help with. After dinner, we worshipped with the Cruisin’ for Jesus church and were blessed by a “sermon” presented by the Pastor from Lifehouse, Pastor Brian (translated into Spanish for the rest of the congregation by our good friend Carlos from Cruisin’). Praying over the slab before construction begins. The church dedication. Day 50, Thursday, June 13 – Jacin and I celebrated our 15th wedding anniversary by taking a trip to Mexico (and……done). We headed back to the project to help with painting the interior of the church along with some last-minute touch up. As Journey church was working on completing the buildings, Lifehouse church held a vacation bible school program for the neighborhood kids with the new puppet trailer! It was such a blessing to see it being put to use, and being able to witness all of the children learning about Jesus. After VBS, we headed to the associate pastor’s house (Daniel) for another home cooked meal, which was a spicy soup with chicken, pork, and hominy. We were even treated to live music provided by the Pastor’s daughter and Daniel’s son. We ate inside a building that is on the back of Daniel’s property, currently being used as the meeting spot for the church. He showed us a spot in the floor where he had recently fallen through during a worship service as he was jumping while praising. 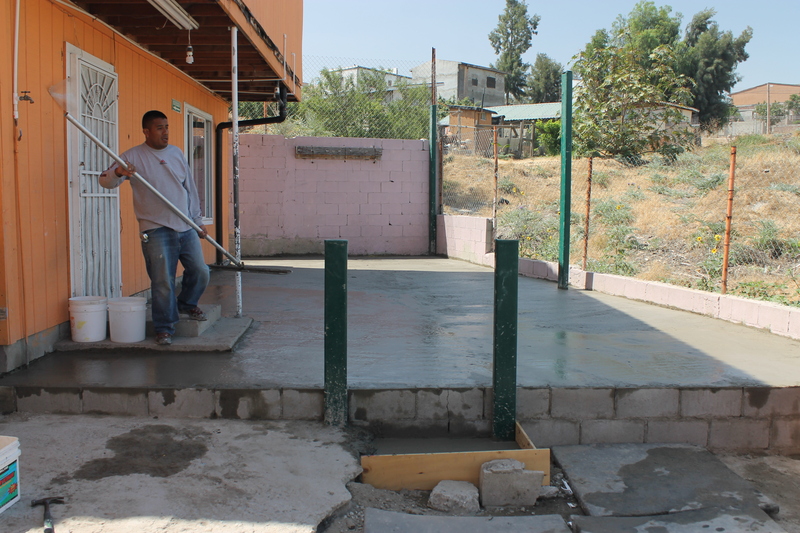 The concrete floor of the new building will be more sturdy for all of their spirit-filled dancing! 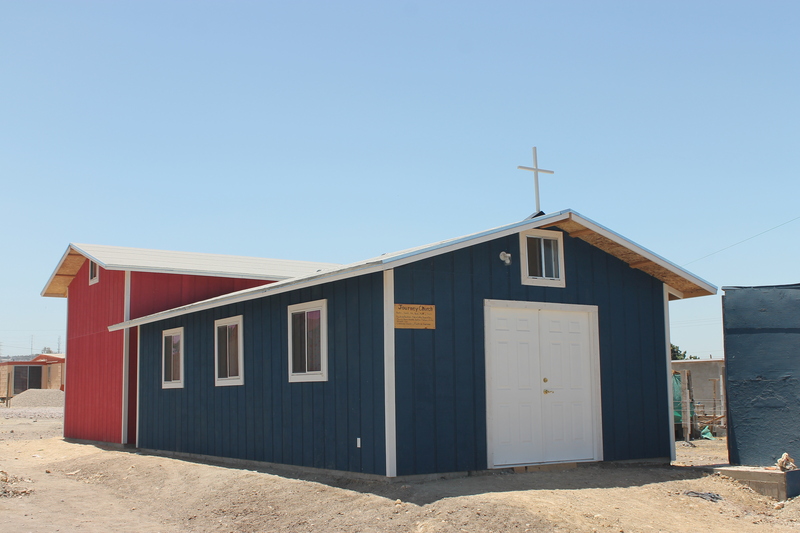 Daniel said that once the church has moved into the new building, he and his wife plan to turn the old location into a home for women in need. Once again, we ended up leaving early once the only job left was to paint the inside of the house. We gave Amalia a ride to her first bus stop and headed to Walmart with the intention to have some pictures printed for Juan and Alma. But, just like the last two previous times we’ve attempted this, we forgot the hard drive at the base. It’s a good thing we will be here for a while yet. 🙂 We had dinner at the base, then joined both groups and the entire church in a dedication ceremony in the new church building. Pastor Robert from Cuisin’ for Jesus was our translator for the evening. It was truly an honor for us to be present at the first service held there! After some great worship followed by cake and coffee, we headed home to crash for the night. Nation was complaining about being itchy, and we found several bites all over his body. Chalking it up to mosquitos or some other friendly biter, we slathered him with some lotion and turned to dreamland. Day 51 – We joined the Lifehouse church for a trip to the AIDS hospice. This place is truly amazing. They receive no government support, so are just funded by donations. They generally have anywhere between 80-100 patients in all different stages of the disease. While the Lifehouse group held a short worship service, Jacin and I had the pleasure of visiting with Rick Lopez, a resident of the facility who lived most of his life in San Diego. He has been battling the disease for many years, and was very up front with us regarding his life and the mistakes he’s made, and how some of us need to have a decent smack on the head before we pay attention to God. His faith is strong, and he seemed hopeful, even while he shared stories of all the people he’s met in the center that have gone to be with the Lord. The disease can affect everyone so differently, and often times a person who is feeling strong one day will take a quick downturn and be gone within a few days. Rick told us how lonely many of the residents are, partially because there is still much discrimination in Mexico against infected people due to lack of education. His family visits once a month, but we could tell he misses them. 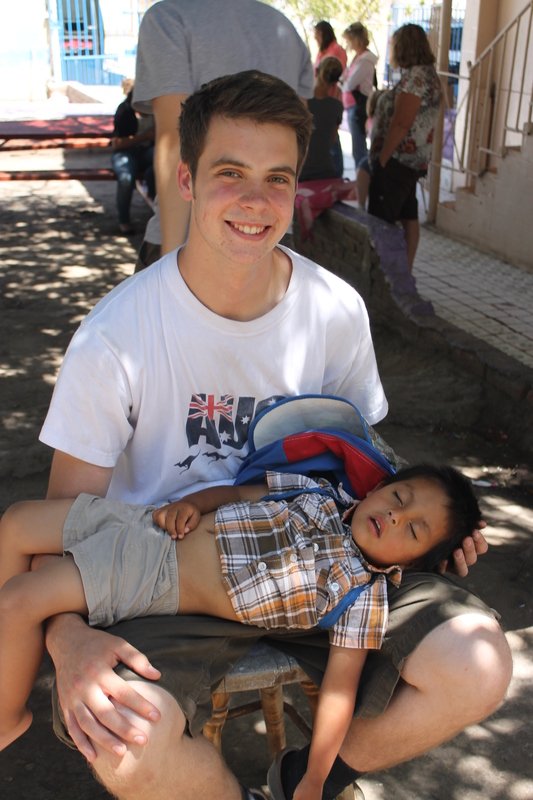 We look forward to seeing him again when we visit with the Rapid City Open Bible church next week. This is yet another ministry in which we wish we could invest more time and help in some meaningful way. We will be praying that God shows us just how we can best do that. Back at the base, I spent the afternoon working while the rest of the family helped around the base (the two church groups headed to the beach for rest of the day). Jacin drove Amalia home, and on the way they stopped at several hardware stores to purchase a couple of concrete washtub sinks for Cruisin’ for Jesus. (I cannot remember if we’ve mentioned this yet, but these men cook over a fire outside and do their laundry in buckets because the cost of electricity is extremely high here. 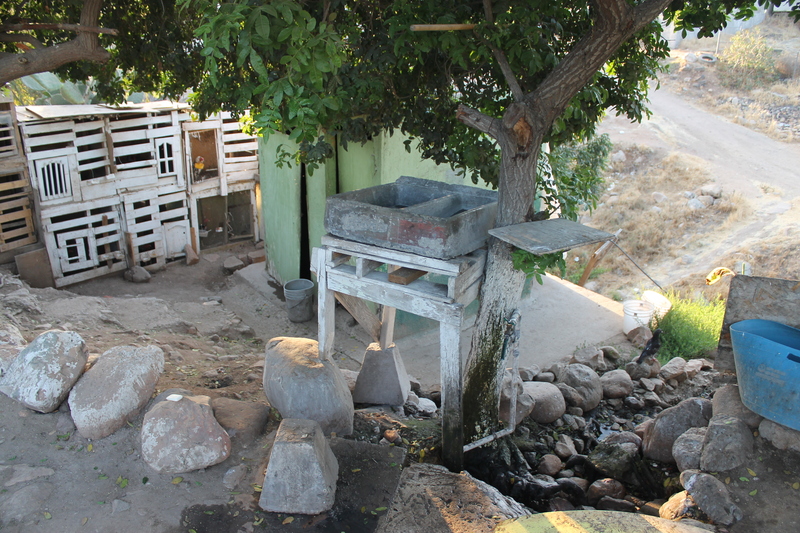 We had been praying for a way to bless them, when we came across some fantastic sinks at a local Marketeria that have a washboard on one side and a nice deep basin on the other. We were unable to have them priced the day we saw them, so thought we would just run it by the Pastor for approval and figure the rest out later. Amalia was an angel and did some shopping around for us on her way home the day before to find us the best deal.) We delivered the sinks just before dinner and had a chance to visit with Pastor Robert in more detail. His history is one of drugs and alcohol, and his heart is truly for the men who are there to get clean. He told us that while the cost of electricity is a driving factor for not having more amenities at the home, it is also a very humbling experience for the men to have to wash their clothes in buckets and prepare their food over a campfire. He wants them to appreciate everything that they once had but gave up for drugs. The men there are simply incredible and we have been blessed getting to know them more and more each week as we worship with them and feed the homeless with them. Jacin made plans to pick Carlos up on Monday and take him to get materials to build a base for the sinks, as well as a new base for the cooking area. We finished our evening with quesadillas from a stand near the base, followed by a few games of pool with the Journey team. Nation complained again about being itchy when climbing into bed, so we looked him over and realized there seemed to be more bites than the day before. 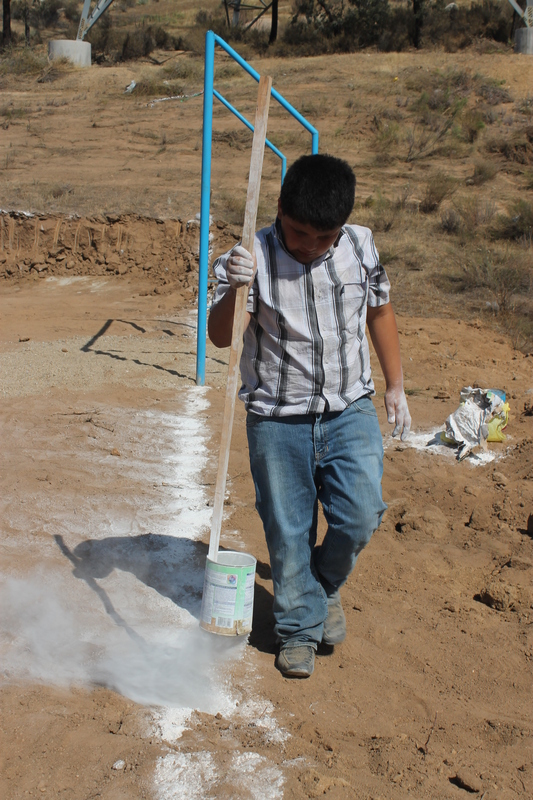 I looked up pictures online and was not pleased to conclude he had gotten into a patch of fleas during our week at the build site (he played in several dirt holes and was running around with kids the whole time, and bugs just seem to find his marshmallow skin too tempting!) I decided not to share the lovely news with him until I could confirm my conclusion with Amalia the next day, but I mixed some eucalyptus with some lotion and slathered it on (I have no idea how I would survive without the internet). 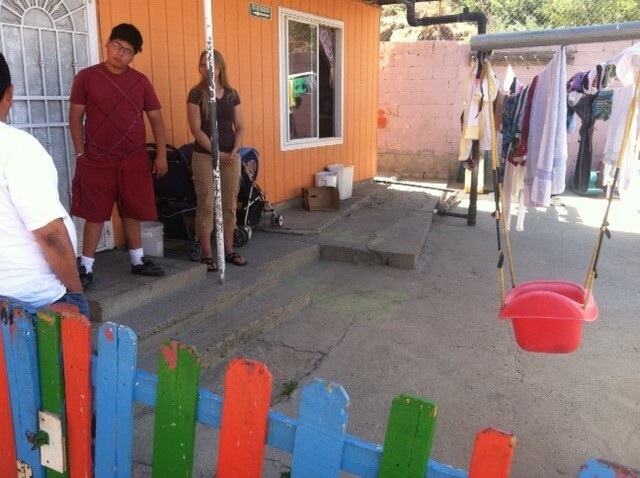 This is the laundry and kitchen for the ministry “Cruising for Jesus, Tijuana”. We asked if a washtub sink would help, they are so cheap, they now will have two. 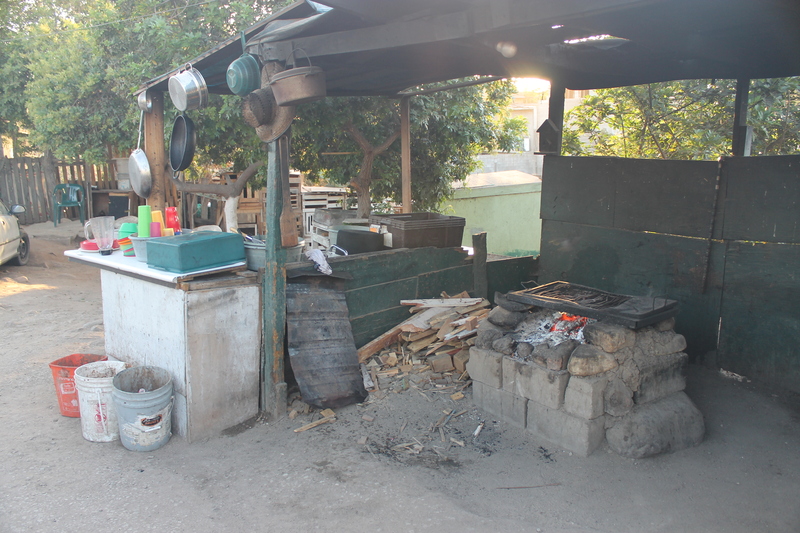 This lead to them telling us they want to improve the kitchen with a concrete block grill, so Monday we are going to pick up the materials for this. This ministry is special to us, as Pastor Robert (in the red) and Carlos (an ex L.A. gang member) have really touched our kids. 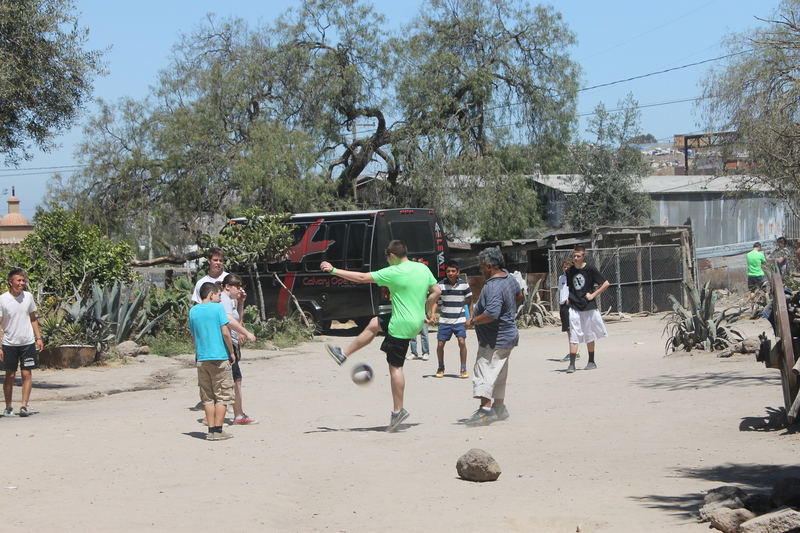 They have incredible stories of kicking drug habits through Christ. They continue to pull men of the streets who want to get clean. The living conditions are terrible, but Pastor Robert explains that as he learned in the US Marines, they gave up great lives to drugs. He wants them to be reminded of the wives and children they abandoned to habits that put them in poverty. There are great stories of wives forgiving them and taking them back. This is possibly the most life changing ministry we have seen. The men from “Cruising for Jesus” showing their laundry and kitchen. 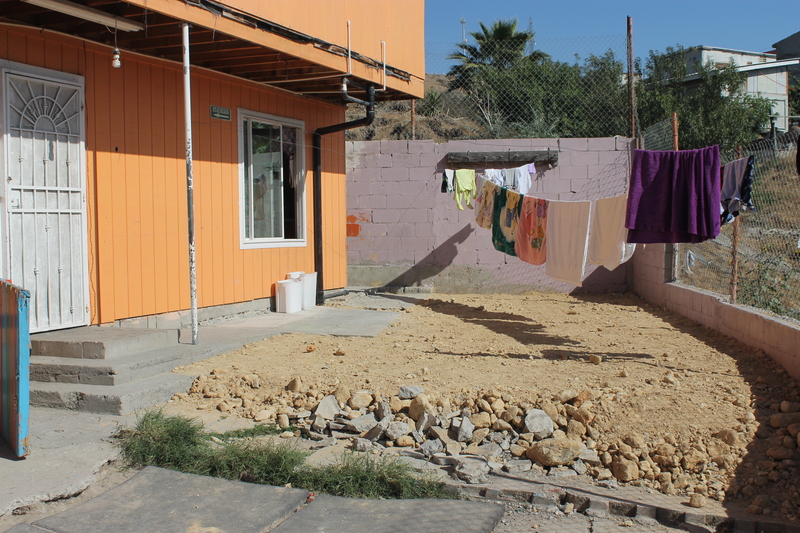 Day 52 – Saturday, June 15 – Jorge from the orphanage (Casa Hogar Sion) called at 6:15 wondering when Jacin was going to arrive so they could start pouring the concrete. We had been so busy all week and Jacin was so worn out that he had forgotten to touch base with Jorge to get a time figured out, but we honestly didn’t expect them to be ready to start so early! 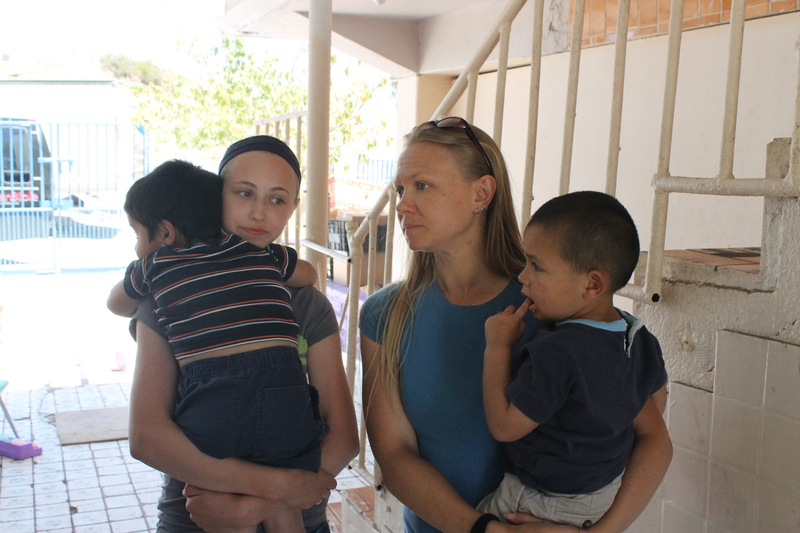 After stripping several beds to wash away any lingering fleas, we helped Amalia in the kitchen and bade our new friends farewell as they headed home, and by the time we got to the orphanage, the project was basically done. A great group of boys from the home were helping several men with the mixing and pouring, and we were lucky enough to witness a few dunkings into the water tank. They did such a great job, and we were so thrilled that they just took charge and got it done. We played with the toddlers a babies a bit before heading back to the base (with many of them crying when we left – so heart breaking!). After returning to the base, we found that Amalia had already stolen our laundry pile and remade our beds (she is constantly taking care of us, even though we ask her not to; I don’t think she knows how NOT to serve others). I showed her Nation’s bites and she basically told us they were from fleas, or at least we are pretty sure that is what she said. There was something in her words about dogs, being at the church building site, other kids, and lots of other words we didn’t quite figure out, but she gave us some Benadryl tonic out of the first aid kit to help with the itching. She didn’t seem too concerned, so we have decided not to be, either. Angel, Amalia’s grandson, showed up to play with Nation, so while the boys had another water balloon fight, Justice and I headed up the street to the local flea market (thought not to buy fleas, because we already have some of those). It was like garage sale heaven for us, as we dug through piles of clothes (all in very good, like-new condition) and found a few shirts we couldn’t live without. After spending 68 pesos on 7 items (roughly 75 cents a piece), we went back to base and have been vegging with the family since. Jacin is pretty wiped out and looking forward to a few days “off” without groups at the base. Its hard to see in the photos, but the old concrete was rough, unlevel and had a lot of steps in it. For babies and toddlers learning to walk, this was a mess. They now have a large, flat, nice area to play in. They even set posts for a screened cover to cut down the sun and heat. The hope is that groups seeing this improvement will donate to do the next slab, which is worse, but wasn’t where the toddlers play. Day 44 Friday June 7 This was a day of base projects. I crawled into the attic before it was hot to check the exhaust fan squeak. No fan! up to the roof, and there it was. The fan squeaks so much, Amalia doesn’t use it in the kitchen. I found the bearings really needed oil, and the belt was slipping and really dry rotted. Marcial took me to the to store to get a belt, and I lubbed the bearings. Sounds great now. Then on to Kathy’s awning. I made the frames and painted them. The group came bake, and Kathy asked if I would drive so she could work on administrative duties. SO we as a family were able to go to the market, and then to the beach. 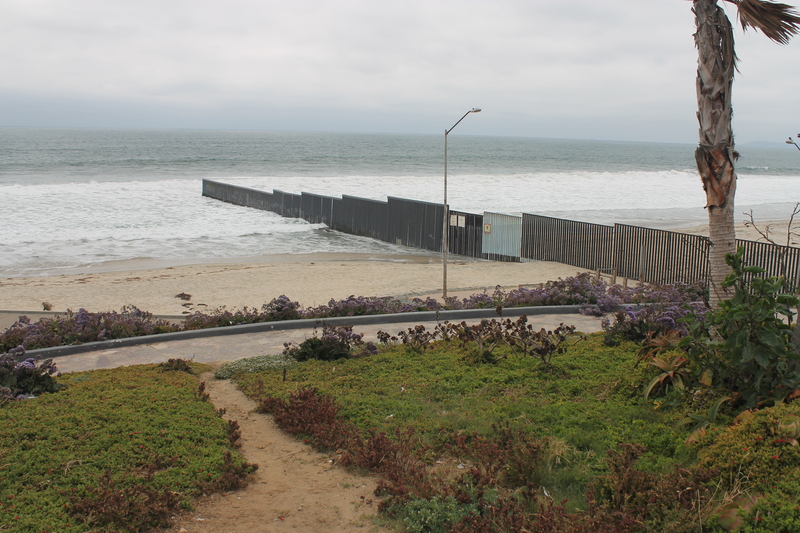 this beach is at the border, so we played in the water at the fence. Weird to see the fence just end in the water. Day 45 Saturday June 8 We were up early to cross the border. We need to move our camper. Greg was gracious and let us park there for free, including the Memorial Day holiday. This was a blessing, as there was no storage anywhere for the holiday. He has work to do and need it moved. 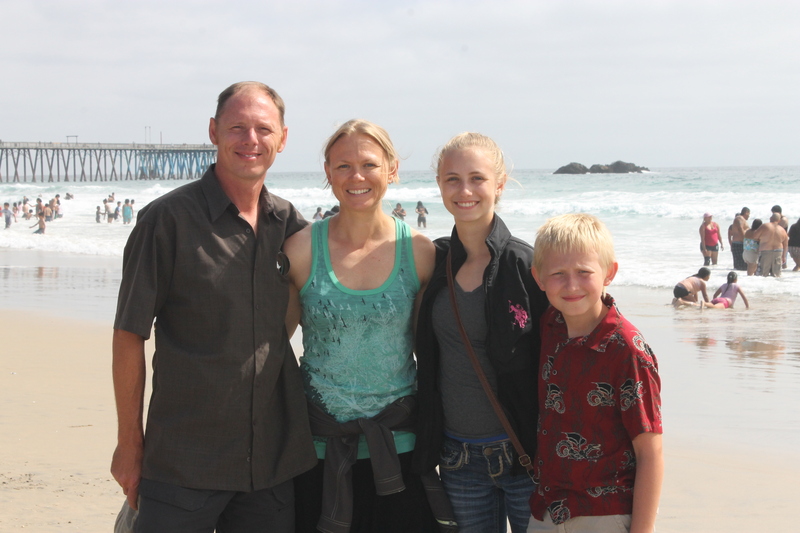 We were blessed again to find Oka Creek Rv Resort just up the road to the easy of El Cajon. This means not having to drive into San Diego traffic, nor back out when we leave. As we will be headed east, it is already headed the right direction. We got back to base early afternoon. 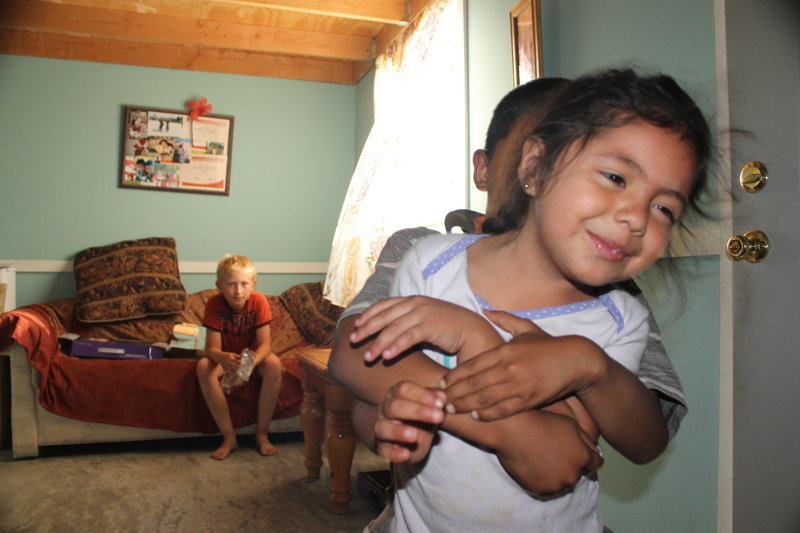 We had planned to let Nation play with Angel again, but going to the states shortened the day. We made up for it by taking Amaliea and her daughter, and Angel to ice cream! Then the kids had a water ballon fight. It was so great to see them laughing and having a great time, even through the language barrier. Danielle worked the rest of the day, and I worked on the puppet trailer. We plan to use it this Thursday, so I need to get the final details done. We did run to the store for chicken, so we could make a familiar dish for dinner. Day 46 Sunday June 9 I got up and worked on the awning for the base office. All the parts were dry, so I installed it. It looks pretty good, as we used the same roofing material as the base. They had some extra on hand. Then more time on the trailer, getting latches installed. Danielle worked again. 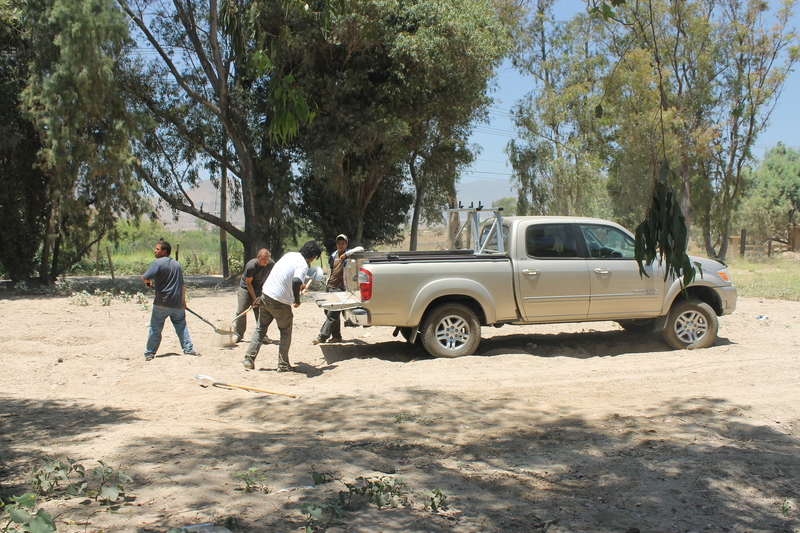 The two new teams arrived, and I ran to check on the concrete project as Casa Hogar Sion. They have the fill dirt in, a pipe moved, and the fence out of the way. It looks awesome. We plan to pour next Saturday. The toddlers will have a nice new flat concrete pad to crawl and walk on!! Day 47 Monday June 10 We had a HUGE day today The Journey church from near Des Moines has committed to a house and church, with only 6 people!! Dave and I are helping, and Danielle and the kids will be there to paint. Fortunaly, the team from Lifehouse church (also near Des Moines) came to help paint and frame for the first day. What a blessing that was. 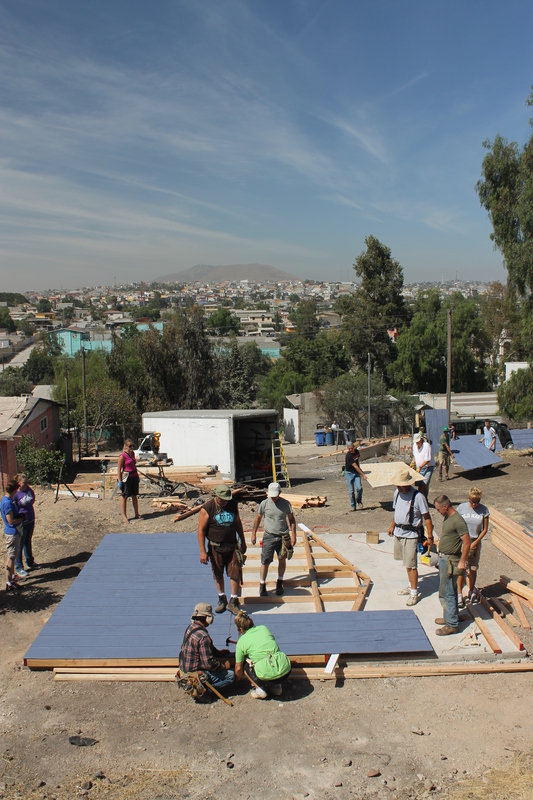 It was hot and we had a lot to do, but we made it to installing the floor for the house, and have the roof framed on the church. This is great, as it is really stuff that doesn’t happen until the second day. We are all tired, but excited about the progress. Praying for the same tomorrow. WHAT A DAY!!! This morning I got to go to devotions, and mom helped the cook. Then we left for stuff with the group which was finishing a house and serving hot dogs. Came home and had devos and then we got ice cream. And here I am… working on this… and yeah. We will try to recap the last week as painlessly as possible. We are finding that it is easy to get through a day and be too tired to do much more than crash. Day 36 – Nation’s 10th birthday! Nation had looked up the following phrase earlier in the week and been practicing it, so was VERY eager to be able to say it to as many people as possible: “Hoy es mi cumpleanos” (today is my birthday)! Amalia helped Justice make a chocolate cake from scratch (finding cocoa powder took 3 store visits! ), and Justice decorated it with several colors of homemade frosting (sour cream as the main ingredient), chocolate shavings, sprinkles, chocolate chips, and chocolate syrup. Marcial graced Nation with the traditional birthday song at lunch. 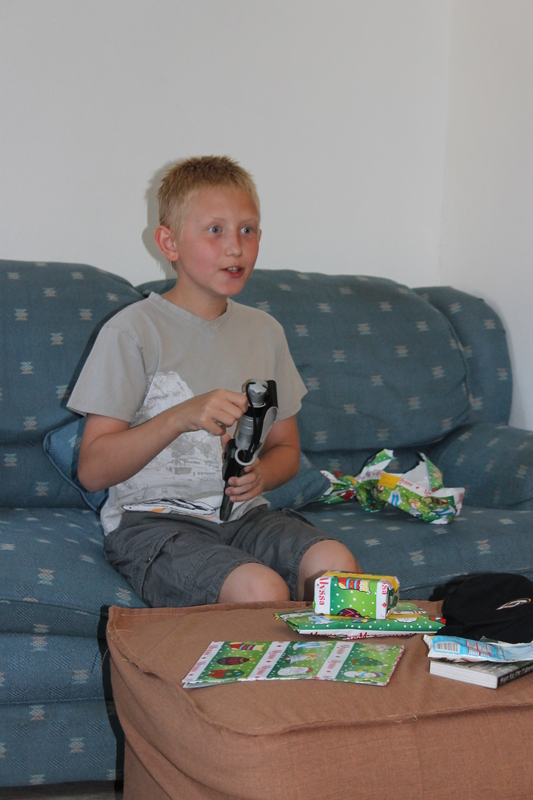 After dinner, Nation opened his gifts: toe socks, a hunting knife, and kinder eggs – we are grateful that our kids are so easy to please! We then attempted to find a movie in English, but the only ones in the theatre were far from kid friendly, so 2 movie theatres later, we decided to hit Wal-Mart and let him pick out a DVD. He chose Rio, and we headed back to base, where the Georgia group helped us to celebrate with a nice face-in-the-cake end to the day (while everyone chants, “Mordita, mordita!”). We watched about half of the movie before we couldn’t hold our eyes open anymore. 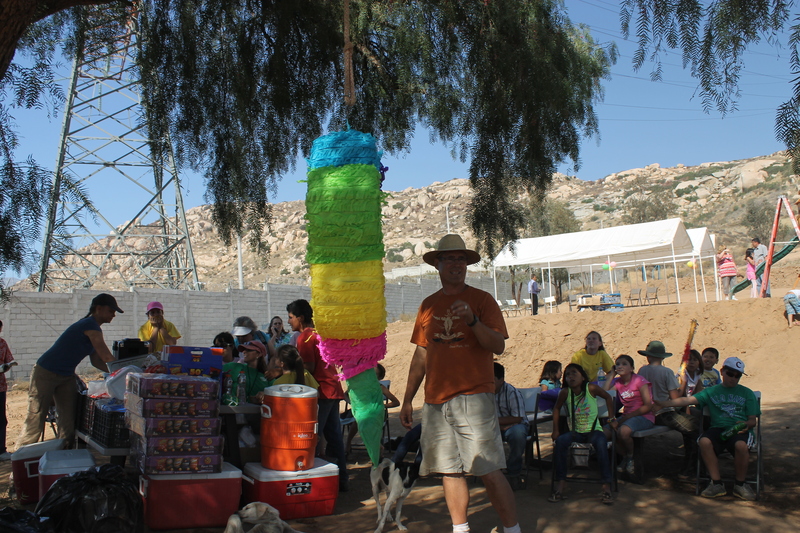 Day 37 – We helped the Georgia team wrap up their project by preparing for a neighborhood fiesta and putting up a playground and soccer goal posts. They cooked hot dogs and burgers on new BBQ grills they installed the day before. The neighborhood kids played games, knocked open a couple of piñatas, and joined their families in a meal wrapped up with cake. It was a long, hot, dusty day, and we were all pretty exhausted when we got back to base. Day 38 – Saturday – The Georgia team left for home early in the morning, and we helped Amalia prepare the rooms for the group coming later in the day. Amalia’s grandson, Angel, had come along to help Amalia (he mostly enjoyed Nation’s company as they played games together), then Jacin took all three kids to the market while Danielle worked. After the market, Nation did not feel well, so he ended up sleeping the rest of the day, giving us all an excuse to take it easy. Even though it was a fairly light day, we all slept hard enough to not hear the group that came in late that evening, great people from Open Bible church in Boone, IA. 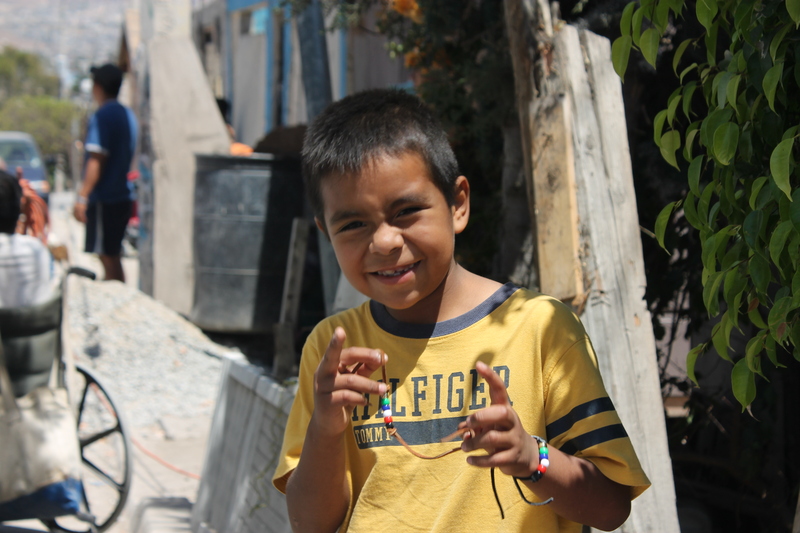 Day 39 – We went to church with Marcial in a building that used to be a boxing ring. They have a section where you can plug in headphones and listen to the sermon in English. The chairs were pretty close to the speakers, so it was difficult to make out the entire sermon, but it was great to be able to catch the gist of it after having so many weeks without “real church”. After lunch, we decided to cross the border to check our voicemail, check in with Greg regarding our RV, and grab a few thing that we hadn’t been able to find in Mexico (or possibly did find but didn’t know it 🙂 ). When we checked the website before we left, it looked like our wait to get across would be just over an hour. It actually ended up being 3 hours on the nose. There are so many vendors in the line to cross that you could just plan for dinner and dessert while you wait, as well as picking up last-minute gifts for anyone you may have forgotten. Our first stop was McDonald’s because we all had to use the bathroom so badly and it was the first place we saw. We were reminded very quickly how spoiled we had become by the good service in Mexico, where even though we cannot speak the language well, the vendors are always so willing to help. Not so in the US! We hit a few stores and touched base with our moms. It was refreshing to be able to read and understand all of the signs, find everything we were looking for, and just hear from family. We also experienced our first two-level Wal-Mart, where you ride the escalator next to your shopping cart, which has its own lift. The border crossing back was easy and uneventful, and we called it a night in order to be rested for Monday. 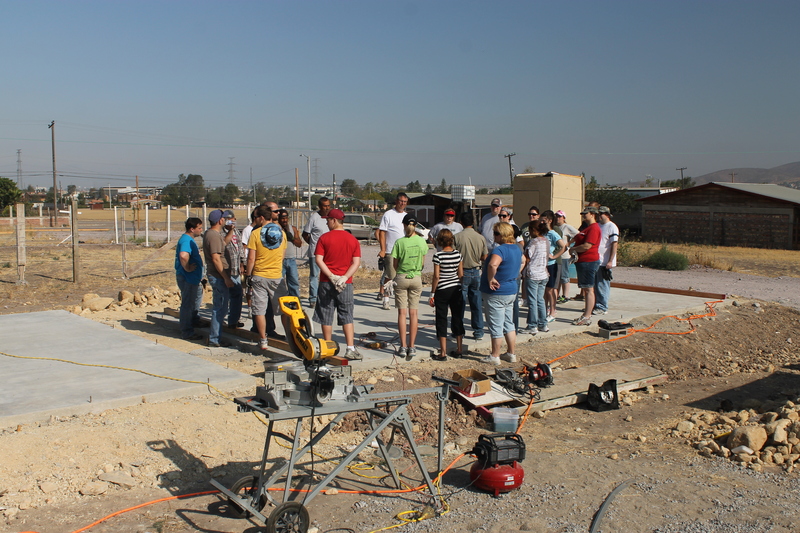 Day 40 – We went with the Iowa group to help with their house building project. 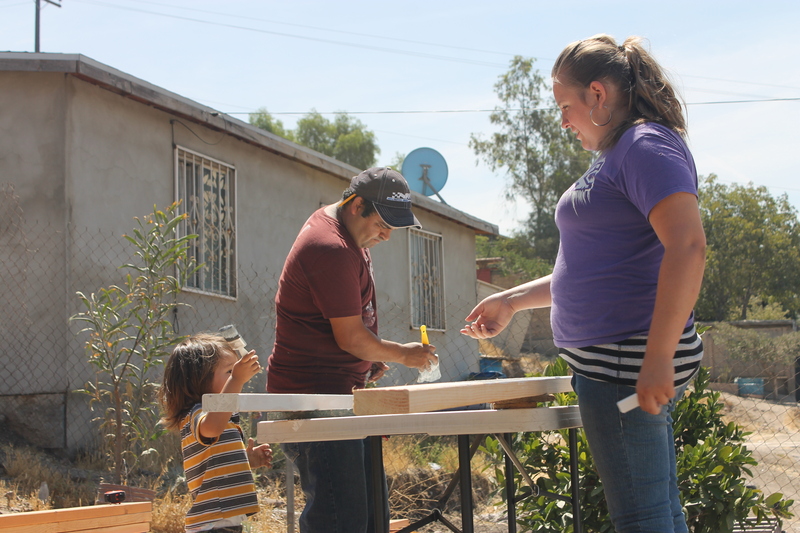 Several of the team members had built several of the Puente homes in years past, and they had a very efficient method to everything. Even the teens jumped right in and were great. We had all four walls up with the floor joists in by the end of the day. It was a lot of work, but so rewarding to see how much could be accomplished with such a great team! 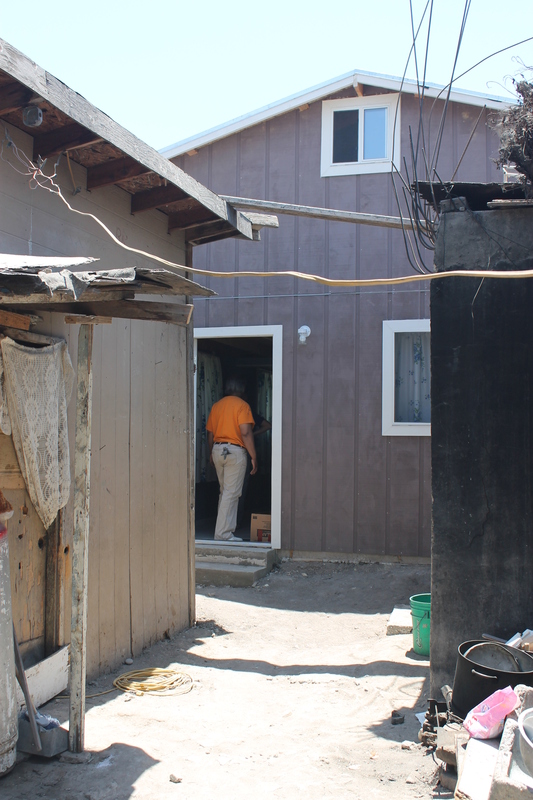 The home is being built for Balbina, a single mom, and her 2 teen boys, the younger of which (and Balbina, due to her unfaithful ex-husband) has AIDS. The family was very involved and helpful throughout the day, painting and doing whatever else they could. 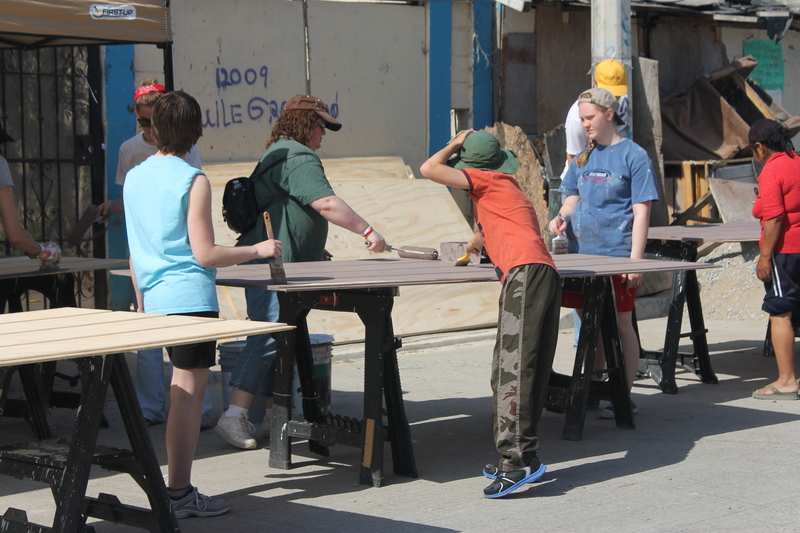 Day 41 – Jacin went with the Iowa group and roughed in the electrical for the house, then helped frame the roof. Danielle and the kids stayed back and helped Amalia with curtains for the new home as well as general projects around base, and Danielle put in a few hours of work. We were incredibly blessed to find out that Jacin’s relatives sent a generous donation to fund the concrete project at Sion orphanage. We will be in contact with Jorge and start planning tomorrow. Day 42 – The Iowa team was far enough ahead that they didn’t require Jacin’s assistance on the house, so we went with Kathy to Sion to talk with Jorge about the concrete. He had arranged to have a few men who will be assisting meet us there. Based on what they believe the materials will cost, we should have money left over, and we’ve obtained permission to use the remaining funds for whichever projects God brings to our attention. This is an answer to prayer, because we were starting to question God about how long we are supposed to be here, whether we were somehow delaying the start of Jacin’s career by not being in the US. But God made clear that he intends for us to be here a while longer, because we have funds that now need projects. Please be in prayer with us about what our next one should be, because there is need everywhere, and it is difficult at times to discern what would be the most effective use of our time and resources. 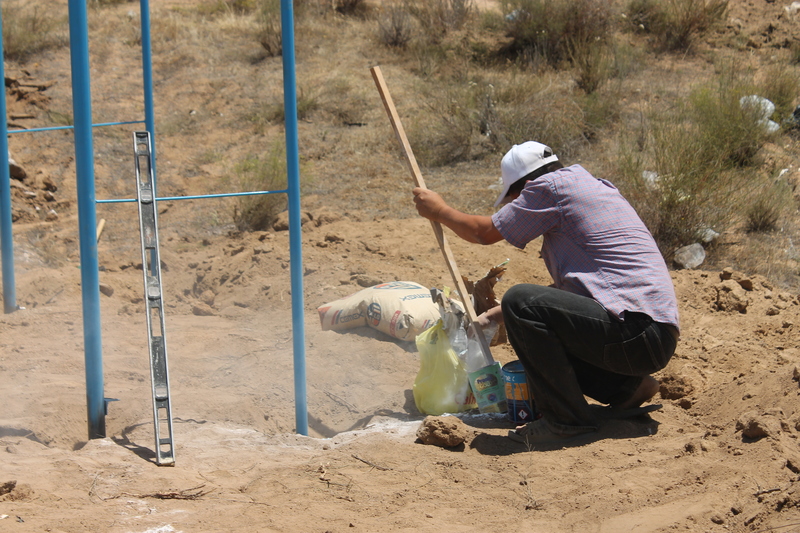 We scheduled our concrete project for two Saturdays from now, so that his men have enough time to prep the ground and get all of the materials together. Everything has to be mixed by hand, so we are grateful that he has many able-bodied boys at the orphanage to help. Many hands make light work! After our meeting, we went with Kathy to a men’s hospice house to deliver donations. 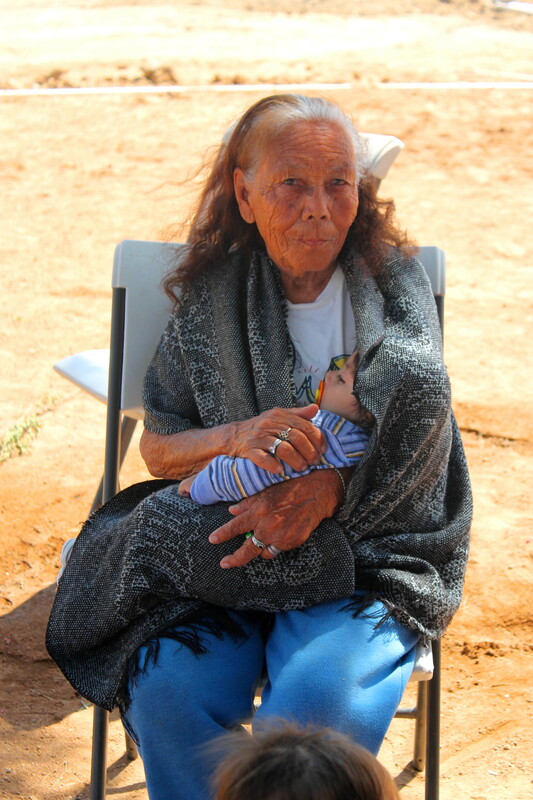 The house is run by a woman who completely depends on the Lord to cover all of the facility’s needs, because she receives no government assistance, and the men (generally older without family to care for them) do not have resources to contribute. 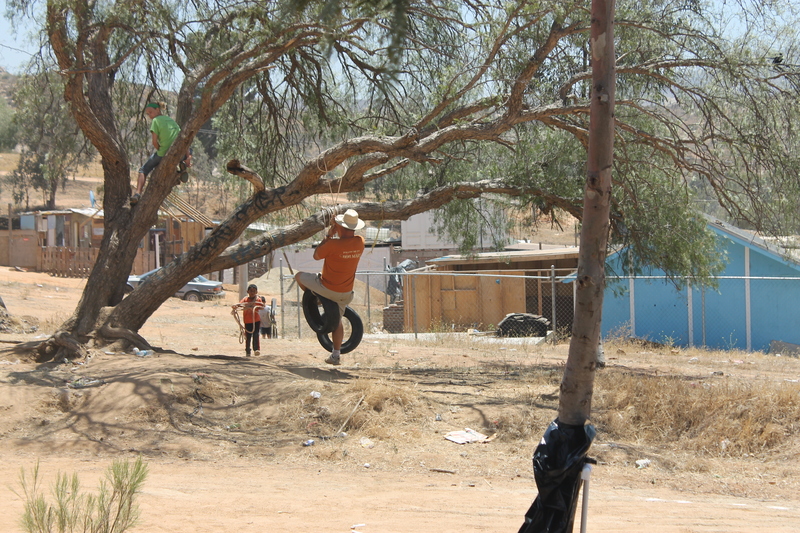 The home is on a hillside that overlooks Tijuana, and it was so peaceful. It was so clean and the men we met all seemed very content and well cared for. A team a while back built the men an elevated raised bed garden so that the men in the wheelchairs could tend to it. They had tomatoes, peppers, chiles, cilantro, and onions growing – all the fixings for a great salsa! And quite unexpectedly, we met a man there from Watertown, SD, who had moved to Mexico a while back with his wife, and is now single and suffering from a blood disorder. What a small world! We could definitely see spending some time up there, visiting with the men and just helping wherever it is needed. We then headed to the building site and feasted on chicken salad provided by Balbina. We were just in awe of how a woman who has next to nothing would insist on sharing what she had with a large group of people. Their hearts are so big here! Jacin offered his truck and time to take the Iowa women (and Justice) shopping for items for the house, and Danielle stayed behind and worked while Nation kept himself busy playing guitar and wandering around the base.